SPIDER-MAN: THE MUSICAL... THE MUSICAL! A play within a play (within a play?) The "Inception" of backyard musicals. With great power comes... little to no responsibility. 144 backers pledged $3,520 to help bring this project to life. Oh hey, looks like you made your $2,000 goal already! So why should I still back this project? Good question! First of all, we think you should back us because you can get an amazing t-shirt OR a beautiful poster for just $25. You could even score a weird board game starring our characters and YOU. We promise to make these rewards well worth your while. Or you can choose this poster for $25. Wow! All of these will mean that YOU, our gracious supporters, will enjoy SPIDER-MAN: THE MUSICAL: THE MUSICAL even more -- whether you're actually coming to the show or backing us from afar and eventually watching it on the web (get it?!). To be clear, we will eventually post our video recording of the musical online for everyone to watch for free. But that's no excuse for not flying to Nebraska from all parts of the country to see the show live! You're all coming to Nebraska, right? Most Kickstarter projects have stretch goals that seem focused on only one thing... Moolah. Cheddar. Benjamins. This August 22-23, from the people who keep making those pop culture musicals, comes something truly beyond human comprehension. Genius, hubris, and madness have found their purest expression in SPIDER-MAN: THE MUSICAL: THE MUSICAL. At The Colonel Mustard, our philosophy is to live creatively and love whole-heartedly. Each summer since 2009, we’ve put on an original, free-for-the-public, outdoor musical in downtown Lincoln, Nebraska. We also do lots of other great projects, but the summer show is our biggest event each year. Most of our summer shows have been musical adaptations of things that clearly have no business being musicalized. Jurassic Park, Dr. Quinn, The X-Files… all turned into bizarre song-and-dance spectacles. We’ve been doing this silly stuff for years, so we were both heartened and confused in 2011 when Julie Taymor, famed creator of The Lion King for Broadway -- and a MacArthur Genius! -- chose to emulate our success by creating a musical called Spider-Man: Turn Off the Dark. The similarities between Ms. Taymor’s work and our own are striking. Although she was unable to fully recreate our extremely low-budget style, Ms. Taymor compensated by incorporating rock-bottom production values wherever possible. Ms. Taymor went to such great lengths to mimic our unintentionally dangerous stunts that she nearly killed several leading actors. Our outdoor musicals have been attracting over a thousand excited patrons during their two-day runs each summer, and we’re told that the audience for Ms. Taymor’s Spider-Man musical eventually grew to a similar size. Finally, the music for Spider-Man: Turn Off The Dark was written by Bono and The Edge from U2, just as in all Mustard productions. We’re told that imitation is the highest form of flattery. Given that a talent no-less-esteemed than MacArthur Genius Julie Taymor chose to imitate The Colonel Mustard’s unique vision for a world where every facet of pop culture has been turned into a musical, we think it’s only right that we repay the favor. That’s why we’ve written a musical about Julie Taymor writing a musical about Spider-Man. Wait. Now I'm confused. What is this? Mustard productions are a labor of love. We're a small 501(c)(3) nonprofit and we have no paid staff, just a small army of like-minded volunteers. We work together throughout the summer writing, practicing, building and crafting in order to bring free outdoor theater to Lincoln, Nebraska. An eager crowd at last year's musical. Our initial productions were performed in an attic and pieced together using cardboard, duct tape and papier-mâché. Scene from an attic play. The shows started gaining enough of a following in 2009 that we had to move them outside. We still use cheap materials and retain an aesthetic somewhere between Max Fischer's stage plays in Rushmore and the "Sweded" movies from Be Kind Rewind. Our first free, outdoor musical! Our audience sort of knows what to expect from a Mustard show, but from asking the crowd to explore alongside us in a choose-your-own-adventure musical spanning 20 city blocks (Gods of the Prairie) to creating a reverse-theater-in-the-round spectacle (Jurassic Park: The Musical: 3D) we always strive to give them a unique and unforgettable experience. SPIDER-MAN: THE MUSICAL: THE MUSICAL is our stab at a "Broadway-style" show. It's filled with celebrities. (Mustard actors portraying celebrities, that is.) Spider-Man. MacArthur Genius Julie Taymor. Sir Stan Lee. The terrifying subterranean Spider King. Bono. Tobey Maguire. The Edge. Glen Berger. The list of stars goes on and on. The music is majestic. Every song is completely original. To be absolutely clear -- none of the script, lyrics, or score for SMTMTM come from Spider-Man: Turn Off the Dark. These are two completely separate musicals. It's so meta, man. With SMTMTM, we're skewering ourselves and our propensity for writing these silly pop culture musicals just as much as we're parodying Julie Taymor and Broadway excess. We are happy, nay, excited to make fun of ourselves in this way. It's going to be a blast! We've used Kickstarter to raise funds for our last three outdoor musicals because it's a great way to engage with both our local audience and with weird-theatre-lovers the world over. Relying on the generosity of backers like you allows us to perform these shows for our community without charging anyone an admission fee. Kickstarter lets us share our art, for free, with the people of Lincoln, and later, through recordings, with people all over the world. Raw materials for the set: We don't use pre-fab pieces or hire a professional set builder. Instead, we beg, borrow, recycle from past shows and handmake every part of our set. Sound equipment: With each show, we're able to buy a few more pieces of sound equipment for the Mustard, but we still rely heavily on renting gear. Sound is hugely important for a big outdoor show, and between mics, speakers, and monitors, the cost gets high fast. Special effects and puppetry: This show calls for some elaborate stunts, a little sleight of hand, and one giant, scary Spider King. We can't make these things magical without you. 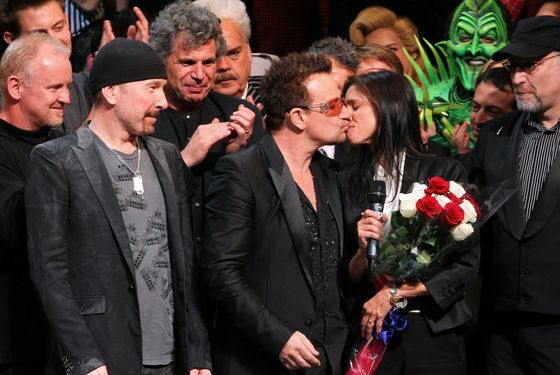 Better costumes and props for MacArthur Genius Julie Taymor, Bono, our three Spider-Men, and everyone else. A higher-quality final recording of the music from the show. I am still not convinced that that this will actually happen. Why should I believe you? This will be our 6th original full-length musical. Each of these projects has its own unique challenges, and we always push ourselves to do things in bigger and better ways. The Colonel Mustard’s most valuable asset is the community of volunteer creators who come together to make each show happen. For SPIDER-MAN: THE MUSICAL: THE MUSICAL we already have a cast, crew and orchestra of over 100 working together to make this dream reality. The script is final, the cast is hard at work practicing their lines, and the crew is already building an elaborate, yet slightly creepy, set. Props and being prepped. Costumes sewn. Stunts botched. Everything is coming together in Lincoln, Nebraska! I'm actually just here for stuff... what can you offer me? At the $1 level: You'll receive our thanks, both on the internet and in real, live ink as part of the program for the show. Like this! Twitter, you may have heard of it. At the $5 level: You'll be able to download all the music from the show AND we'll send you some pretty SPIDER-MAN: THE MUSICAL: THE MUSICAL themed wallpapers for your desktop and your phone. Each year we do a musical we get better at recording the music for everyone on the Internet to hear. We're very excited about how the music for this show is turning out! Here's a sample of some of the recordings we've done in the past. At the $50 level: You're getting a whole treasure trove of Mustard goodies. In addition to everything listed above, you'll get a very nice print of the poster we designed for SMTMTM -- we'll put it in a tube and mail it right to ya! We'll also send you prints of the posters from JPTM3D and DTaHIFoD (all posters shown below). But wait, there's more! We're also going to send along some commemorative SMTMTM buttons and the program from the night of the show. This tote bag design is not final, but it'll probably be pretty much like this. OK, fine, I'll donate... but what's a "Colonel Mustard"? The Colonel Mustard Amateur Attic Theatre Company is a 501(c)(3) nonprofit arts collaborative located in Lincoln, Nebraska. We know how to bring big ideas to life with lots of hard work, lots of planning, lots of practice -- and a little bit of money. We can't make these projects happen without you -- please back SPIDER-MAN: THE MUSICAL: THE MUSICAL. Thank you for your support! And if you like what we're doing, follow along on Facebook and Twitter. Pulling together a project like this always includes challenges: writing music, memorizing lines, Nebraska's unpredictable weather... but no matter what difficulties we have faced in the past, the show has always gone on. MUSIC -- This will be the third year in a row that we record all the music from the show in a professional setting. Each year we've learned more about how to make the music sound great, and our plan this time around is to record all the music before the show premieres on August 22nd. T-SHIRTS -- We're working with the same screen printers who brought us last year's amazingly cool (and amazingly soft) JPTM3D t-shirts. Can't wait to see the final product! POSTERS -- We're working with the same printer who made our beautiful "Jurassic Park: The Musical: 3D" posters last year. They look fantastic, so we expect this to be a smooth process. for the MORAL SUPPORTER -- We'll thank you in our program and send you a shout out on Twitter or Facebook. for the TECHNOPHILE -- You'll be able to download our original soundtrack from the show, plus several custom SMTMTM wallpapers for mobile devices and computer screens (plus all of the above). for the CONNOISSEUR -- We'll ship you the exhilerating SMTMTM poster, plus beautiful poster prints for last year's radio drama "Dr. Thoreau and His Island Full of Dinosaurs" AND "Jurassic Park: The Musical: 3D," and a collection of fun SMTMTM buttons, as well as the program we're printing for the night of the show (plus all of the above). Whew! Just remember: with great posters comes great responsibility. for the COLLECTOR -- In addition to everything listed above, you're getting a hip yet practical SMTMTM tote bag to keep it all in. Why not!? for the MUSE -- Our most talented visual artists will draw you as the superhero (or Broadway producer) of your choice! Then we'll send you this truly one-of-a-kind artwork (plus all of the above).